People looking for the serenity of the African Savannah will find solace in the slot machine called 50 Lions. Designed and manufactured by Aristocrat, this slot machine offers players a chance to win in any of its 50 play lines. It operates on five reels and four rows. The game’s theme is about the animal kingdom in Africa where the lions’ reign is considered supreme. Here, you will be playing with symbols of the lion, giraffes, zebras, tribespeople, and many more. The slot is quiet, except for the ticking of the reels as you spin them. It makes sounds when you land a winning combination, but not to the tune that one would expect from anything that is of an African Savannah theme. Here are the casino game details. As you can see, there isn’t much in terms of bonuses. There is also no wild symbol, but the 50 Lions online slot does pay out a handsome amount of 1,000x your line bet for a jackpot. Game operation is simple, but you must understand the following terminologies. Coin Value – this is the cost of each coin. In the 50 Lions free online slot, the coin is called credits. As a player, you have the flexibility to adjust the size of each credit that will suit your preference. Here, you can set the value of each credit between £0.01 and £0.1. To make this adjustment, you have to click on the CREDIT button found at the bottom of the fifth reel. Bet One – this is a red button found at the rows of buttons below the grid. What it does is it multiplies the number of credits that you wager per line. Typically, players can only bet one coin or credit per pay line. But here, you can wager as much as ten coins. Click the red Bet One Button again to reflect the number of coins wagered per line. You can wager as much as ten coins per line in the online 50 Lions slot machine. Lines – there are 50 pay lines in the free online 50 Lions slot machine. Here, you also have the liberty to choose how many you want to activate. You can put your choice into effect by clicking on any of the five yellow buttons at the bottom of the screen. Once all if these are set, you can now click on the green Start button to spin the reels. To a novice player, the bet calculation can be confusing. So, we will be explaining how it works so you can manage your money better. Here is an example of a scenario after you have made your selections if you play 50 Lions slot game. In this case, your total bet is 50 credits because you are only wagering one coin per line. One credit X 50 pay lines = 50 credits. In terms of currency or monetary value, you are spending £0.50 for that spin. To get this value, just multiply £0.01 per credit against 50 paylines. In this example, your BET PER LINE is £0.01. However, your TOTAL STAKE is £0.50. Now, if you press the red Bet One button one time, you will see on top, in the BET area, that you are now betting 100 credits. The reason behind this is that you doubled the number of coins that you are wagering per line. Since you are wagering two credits per line at 50 pay lines, your total bet is 100 credits. If you wager 10 coins per line, then your total stake is 100 credits. In terms of monetary value, you just have to multiply all three components with each other to get your TOTAL STAKE. In this case, the coin size of £0.01 X 50 lines X two coins per line = £1. Your TOTAL STAKE is £1. However, your BET PER LINE is coin size of £0.01 X two coins per line = £0.02. Knowing this is important, so you will understand how you are getting paid. To win, you must land a combination of the same symbols. This combination must be comprised of the least three blocks of the same kind. Also, you must land them in specific positions. There are 50 specific positions that constitute a winning combination, which is also called a pay line. The rules are the same even if you play 50 Lions slot online for free. You must land the combination starting from reel 1, and the symbols must be on adjacent reels. What this means is that you may land a combo, but it started on reel 2 and ended in reel 5. This does not constitute a win. You can view the specific positions of winning combinations in the game menu. The playtable is shown below. The numbers or values represent the number of credits that will be paid to you if you meet the symbol appearance count. Remember, you will only be paid if the combination landed on a pay line where you have a bet. This is why it is important to wager on all lines on every spin in this slot from Aristocrat. These credits will be multiplied against your BET PER LINE. If you landed three lions on a payline, you won 40 credits. But if you wagered two credits per line, 30 will be multiplied by 2, so your overall win is 80 credits. To get the currency value of what you won, simply have to multiply 80 by your coin size. If your coin value is £0.01, then 80 X £0.01 = £0.80 for that spin. The free 50 Lions slot machine online and the paid one have the same game components. What you see in the demo version is exactly the same as in the real cash game. Here are some features that can help you augment your chances to win or help you double your winnings. Scatter Symbol – the scatter symbol in this game is the Protea flower. It is a kind of symbol that awards multiplier wins against your TOTAL STAKE, not your bet per line. Here, you must land at least three of his symbol to win 4X your total bet. The scatter does not have to appear on the first reel, but it follows the same rules as the combination in the base game. The scatter has to be on a pay line to constitute an award. The scatter only appears on reels 1, 2, and 3. Free Spins – if you land the scatter three times, you will be granted ten free spins. During the free games, the bet amount that will be used, at no extra cost to you, is the same with the bet that triggered the landing of the scatter symbols. Diamond Symbol – this is a special wild that appears only during the free games. It appears on all reels except the first one. It substitutes for all symbols to constitute a win except the protea. Gamble Button – after every winning spin, the red Bet One and the black Bet Max buttons will be replaced with the GAMBLE button. In here, you have the choice to gamble what you just won. If you do, you will be taken to a new screen. In it, there is an inverted playing card. You have to choose a colour and a suit. The card will be revealed, and if you made the right choice, your payout would increase. If you chose the right colour, your win would be doubled. If you chose the right suit, your win would be quadrupled. You can do this gambling game five times only per win. If your choice is wrong, the slot takes all your winnings from that last round. The game has no wild except the diamond, which can appear in the base game from time to time. In some cases, the lion will get stacked on one entire reel. If this happens, it allows the symbols to skip, like as if the lion is a wild. In this case, you can expect a win. You can access this game with no download requirements. It is free in the demo version, which you will find on our site. It is one of the many free slot machines with no download requirement. Another good thing is that no registration is also required. The game is playable on mobile devices, so you can enjoy it on a smartphone or on a tablet. It works on any operating system like Android or iOS. It also works on Windows. For as long as the device has an internet browser, you can play 50 Lions free online slot. To play for free, all you need to do is to click on the game title and wait for your browser to launch it. It needs an internet connection to function. You can play the slot machine called 50 Lions in any device for real money in the same way that you would in the demo version. The only difference is that you can only play with cash in an online casino that has a partnership with Aristocrat. Try your luck, and you may be the next winner of the 1,000x jackpot. Find an online gambling operator that offers online slots from Aristocrat. Once all done, you can now start playing the game. One of the tips you have to implement when playing this is that you have to manage your money carefully. It is easy to deplete your bankroll when playing on slots. A strategy that you can use is to wager the smallest bet and double your stake per line. Make sure that this amount is conducive to your bankroll. What you want to happen in a slot game is that you want to be able to wager as many times as you can, the reason being is that landing a combination can be difficult, considering that there are many symbols at play and that they have to land on specific spots. 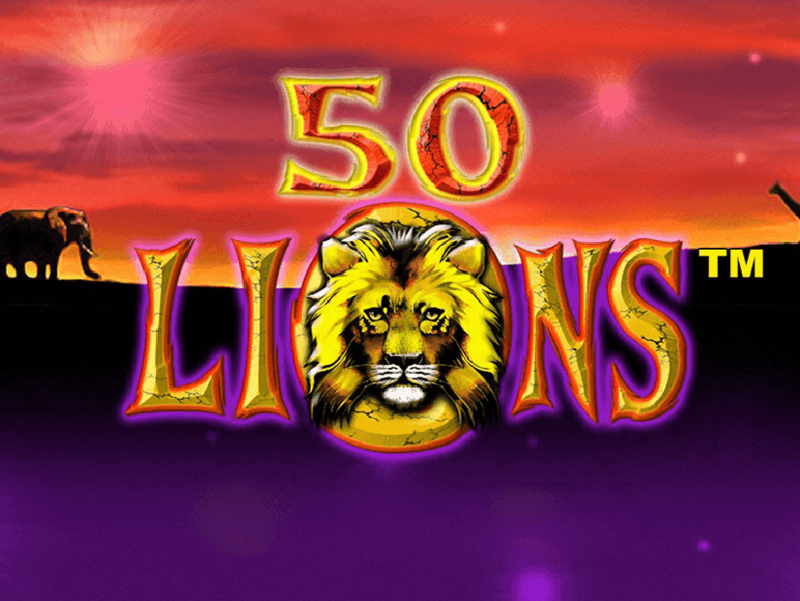 The 50 Lions free online slot is a good way to practice your slot skills for beginners. It does not have the nuisances of many bonus rounds or wilds. It is a straightforward game that introduces you to how fruit machines work, how they pay out, and how the coins and credits systems operate in relation to your money.